While there haven’t been serious scientific studies conducted on the topic, I’m positive that challah can fix just about anything. In case you haven’t picked up on this, challah is a type of bread. To be more specific, it’s traditionally a Jewish bread. Known for its braided appearance, challah can be spotted at any temple or synagogue on a Friday night, as it is used in prayer to say thanks for all foods bestowed upon the good people of this Earth. Not sure how to pronounce it? Click here to learn how. Tip: It’s like saying “hallah” but moving the phlegm in your throat when you say the CH. If you aren’t Jewish, you’ve probably seen challah most commonly in the form of French toast. It has become a rather hefty trend, not only in the United States, but also in Canada. No clue why or how it became a trend, but now it is. The next time you go out to brunch, keep your eyes peeled! While my genuine love for bread makes me a bit biased, I will disclose that others have the reaped the rewards of freshly baked challah. Impasharia, for example, will bake challah anytime she feels stressed! In order to spread the love, Impasharia has provided us with a traditional challah recipe, as well as secrets to making the perfect challah. Let’s start with the secrets! Then we’ll make our way to the recipe: rosemary garlic challah. Don’t be afraid to get aggressive. When kneading the dough for the challah, use your body weight to press down the dough. Really punch it, too. The more you mess with the dough, the springier it will become. Ultimately, you want the dough so springy that if you poke it, the indent will come right back at you. Shower (your dough) with flour. Some people think that bread baking is a science. But really, it’s an art. You don’t have to be precise with your measurements; you just have to feel what’s right. That’s exactly how to determine how much flour to add to your challah dough. Most recipes will provide a range of flour—Impasharia usually exceeds that maximum. She says that bread baking is all about the texture and consistency, not about the recipe! The best way to tell if your dough has enough flour is if it no longer sticks to your hands when punching it. Don’t let your bread get alcoholic. If you let your dough sit for too long, it’ll ferment. Yep, you read that right. When you let dough sit, at one point the yeast will start to ferment and your bread will taste like alcohol! So…you should let your dough rise for about 1 hour. If you space out and let your dough rise longer than 2 hours, either put it in the fridge or stick it in the freezer. Both options will stop the fermenting process. When baking with chocolate or chocolate chips—which is delicious with challah, I might add—make sure to cover all pieces of the sweet, sugary delight by with the dough. If any chocolate is exposed, it’ll burn in the oven (and taste real gross). Some challahs take longer than others to bake. Some bake incredibly fast. To avoid burning your challah, set 5 minutes timers when it’s in the oven. Each time you check on it, rotate the pan 180 degrees so each side of the challah gets a nice tan. *Bonus secret: for all of you garlic lovers out there. Hey. Some people really love garlic. BUT. When making bread (and challah) try not to use too much. And if you do go a bit crazy with it, make sure to spread out the garlic as evenly as possible. No one wants to bite into a large chunk of garlic. No one. *Source: Jill’s Hallah recipe, provided by Impasharia. This recipe, made by a close family friend, has been used all over the world! *Note: The original recipe does not contain the starred ingredients. You can add whatever type of flavor you would like (I recommend chocolate chips, fyi). Yeesh, what yeast. Pour the yeast into a bowl and let sit for 5 minutes. Chop the rosemary in the meantime. Then, add the salt, sugar, whole eggs, olive oil, rosemary, and flour. Mix! Continue to add flour until the dough no longer sticks to your hands. *Note: it’s best to use fresh rosemary and blend it in a food processor. If all you’ve got is dried, then mincing it will suffice. We forgot to add our rosemary till the last minute, so mind the pictures. Kneed like it’s no tomorrow. Really start punching that dough. Use all of your body weight and get it so springy that if you poke it, the indent will come right back up. When ready, put the dough back in the bowl and cover with a damp cloth. Let sit for 1 hour. Braid like you’re in the 5th grade. Preheat the oven to 350 degrees. Put the dough on a lightly floured surface, knead, then divide into fourths. Make each fourth into a “snake.” Flatten each snake and evenly spread the garlic in it. Braid the snakes together on a lightly greased cookie sheet. Top it off. Put the egg yolk on the top of the challah using a pastry brush (we used a fork…oops). Bake for 30 minutes. Check every 5 to make sure it isn’t burning! *Note: rotate the pan every now and then to make sure all sides of the challah get a tan. Eat the challah when it’s hot! If you have any leftover challah, it’s great for French toast (hence why the brunch places use it) or festive bread pudding! Warning from Impasharia: challah dough tends to cling to pots and pans. Wash them immediately to avoid extra cleaning! Want to see (and hear) a funny way to say Challah? Clicks. 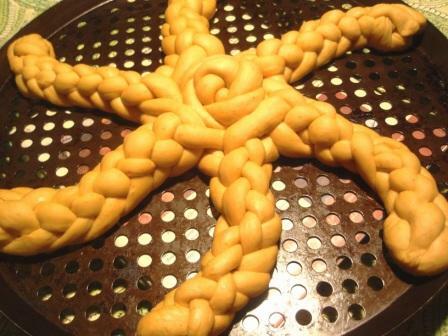 How about challah in the shape of a starfish? CLICKSEE. Last, but not least, what about challah that’s three different colors? CLICKO.